After our own Macau churches tour, Jandy, Cheska and I had our dinner at MacDonald’s in Leal Senado Square. After dinner, we made our way to Wynn Hotel Macau, the first Las Vegas-style blended resort in Asia, where we were to meet up with Daddy, Mommy and Grace. 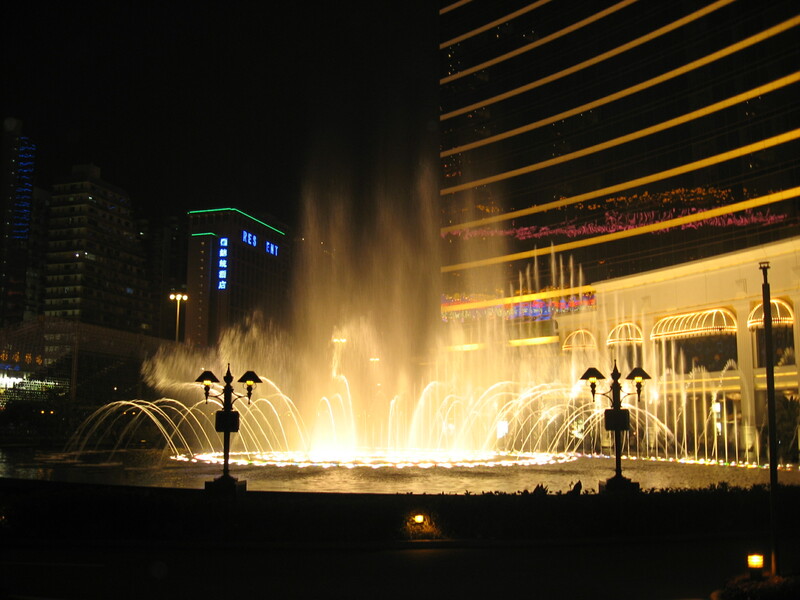 Together, we were to watch the hotel’s signature performance of the Fountains of the Performance Lake and the Tree of Prosperity and Dragon Shows, all open for public viewing and free. When we arrived, they were already seated in one of the benches in front of the fountain and lake in front of the hotel. The lake houses over 200 water nozzles and shooters and holds 800,000 gallons of water. Together, we watched a fascinating and delightful fountain show featuring lofty plumes of water and fire shimmering and dancing through the air to the tune of classical and popular music as well as Broadway show tunes, all expressing a complexity of moods, rhythms and emotions. After this vibrant performance, we proceeded to the atrium in one of the wings of the casino to watch the Tree of Prosperity Show. 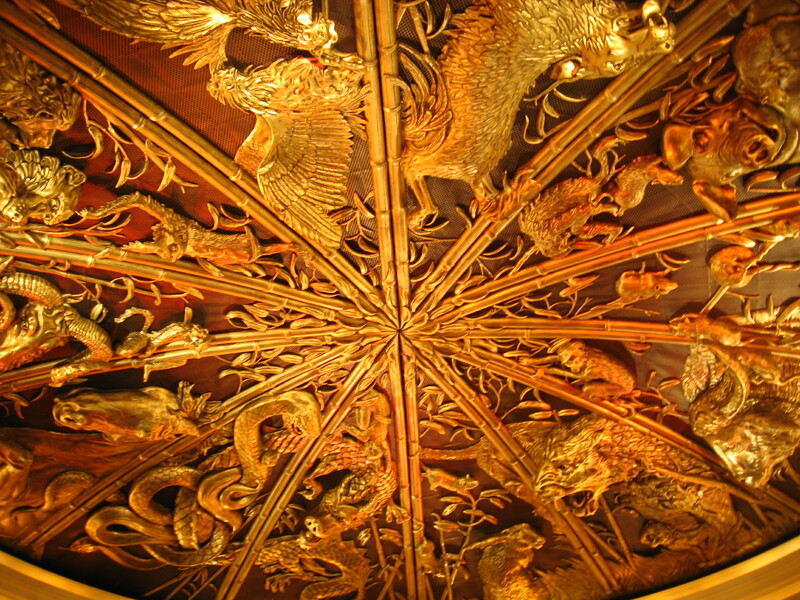 The atrium has an opulent and beautiful golden dome ceiling decorated with the 12 animals depicting Chinese and Western astrological symbols of the Zodiac. 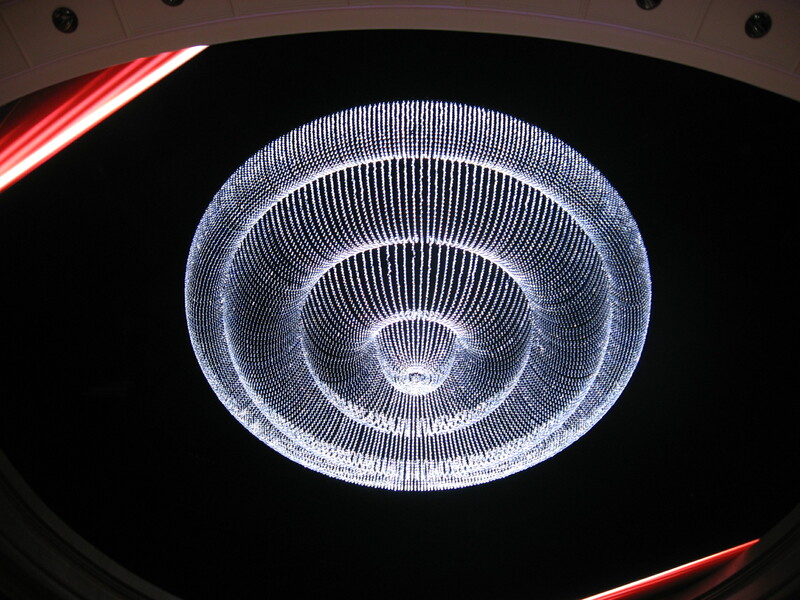 The show begins when its 20 m. wide ceiling opens to reveal a screen of abstract designs. A giant chandelier then slowly descends. At the same time, a copper dome on the ground floor opens and a tall golden tree ascends and then rotates with the music. 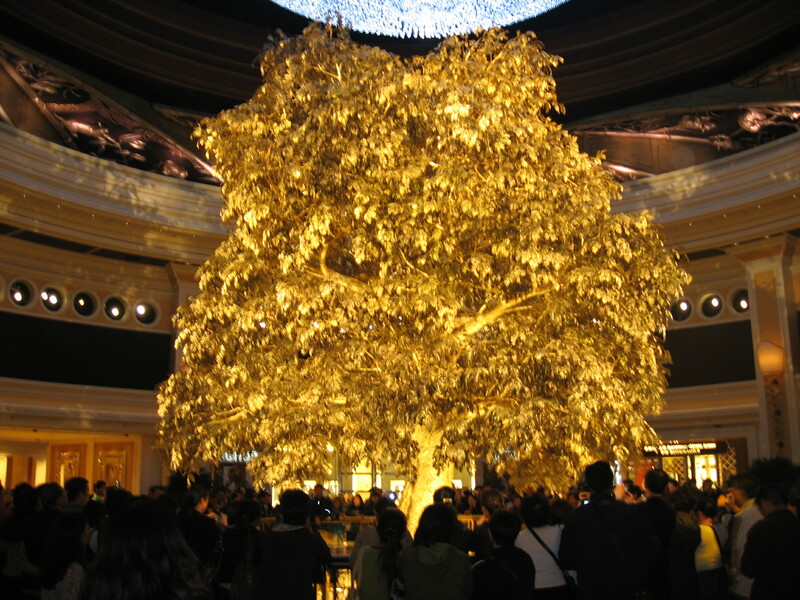 The iconic golden Tree of Prosperity, a symbol of auspiciousness, has over 2,000 branches and 98,000 leaves composed of 24-karat gold leaf and brass leaf. As the tree rotates, there’s a play of lights that changes the tree’s vibrant color according to the four seasons (Winter, Spring, Summer and Fall). 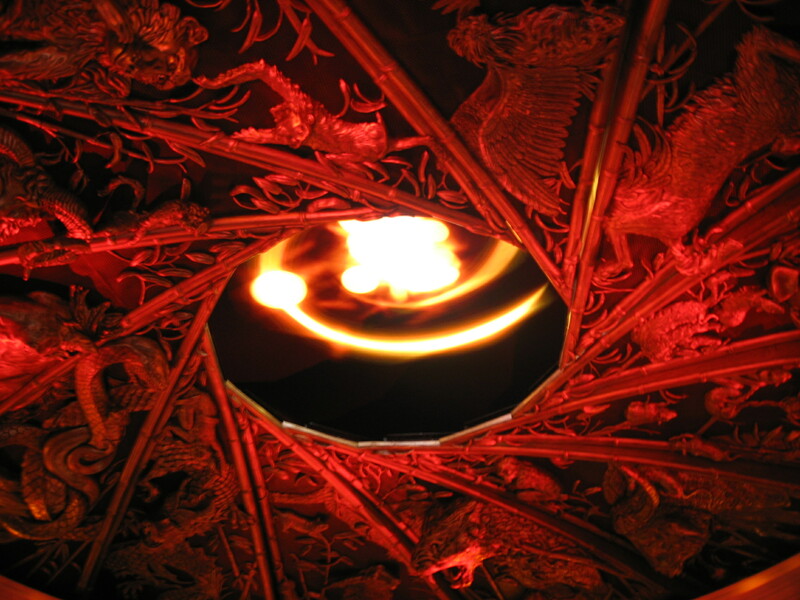 Later, after 30 minutes, we witnessed the Dragon Show on the same atrium platform. However, instead of a tree, a giant dragon structure emerged from the dome on the ground. We, as well as the other guests, can’t help but be thrilled and excited as we marveled at the creativity and showmanship of this truly beautiful and impressive technical shows. 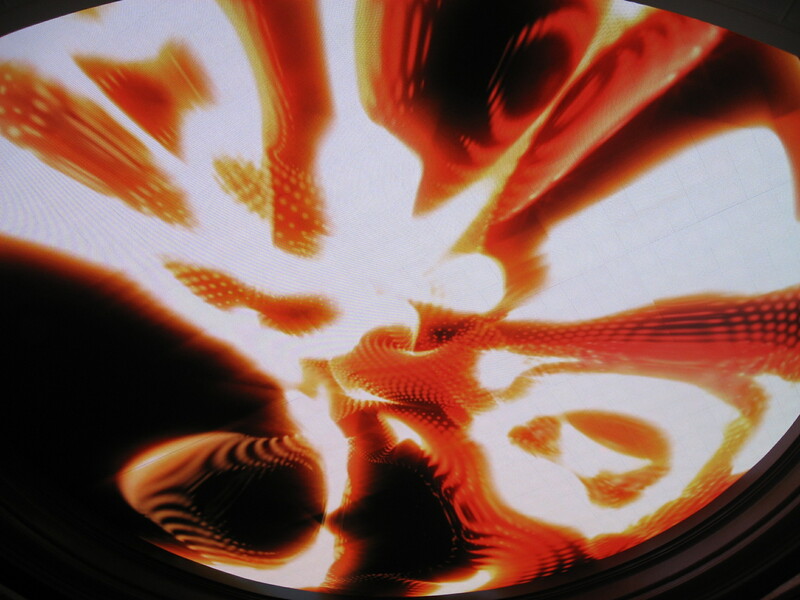 Truly a choreographic masterpiece of shimmering, sculptural patterns, music, video and light. Wynn Macau: Rua Cidade de Sintra, NAPE, Macau. Tel: (853) 2888 9966. Fax: (853) 2832 9966. Email: inquiries@wynnmacau.com. Website: www.wynnmacau.com. From St. Anthony Church, Jandy and Cheska, and I walked to Mount Fortress (Fortaleza do Monte), one of Macau’s fortresses that give parts of city an old European skyline. 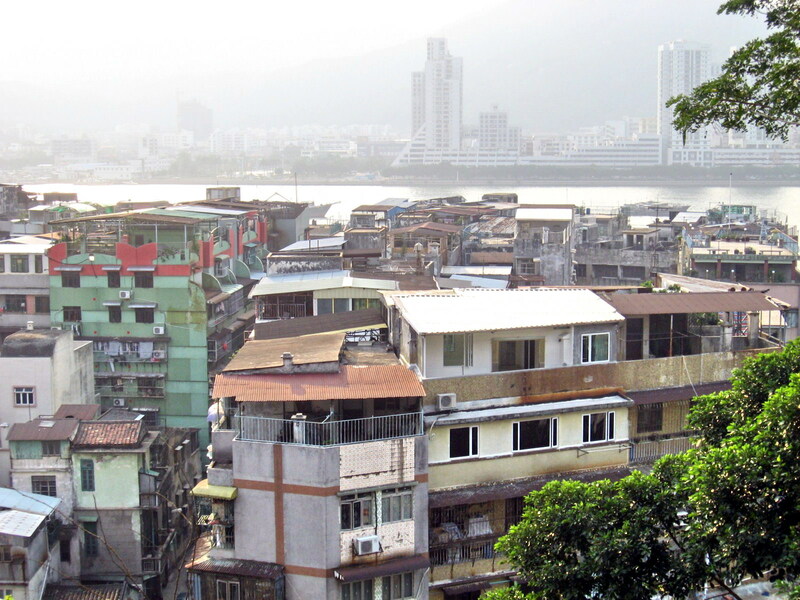 From the fort’s vantage point, we easily visualized how effectively the forts covered all approaches to Macau. 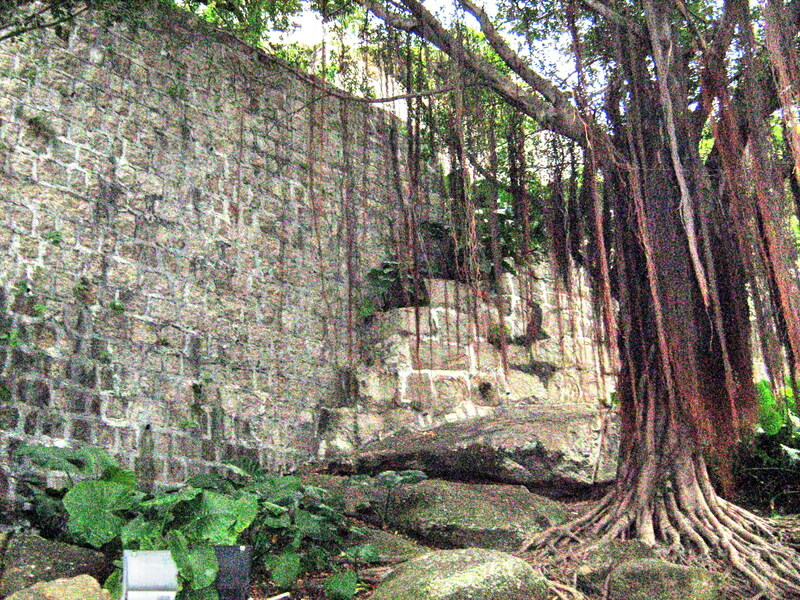 As with forts in Europe, those in Macau stood on stone foundations, with many of the walls differing considerably. They were made with chunambo (said to be able to withstand cannonballs), a mixture of earth, straw, lime and oyster shells, tightly packed in layers between strips of wood. The approximately 8,000 sq. m., trapezoid-shaped Mount Fortress, strategically located on a hill top 52 m. above sea level, was built from 1617 to 1626 to protect the Porto Interior (Inner Harbor), the Praia Grande Bay and, to a lesser extent, the Porto Exterior (Outer Harbor) and the Chinese border. 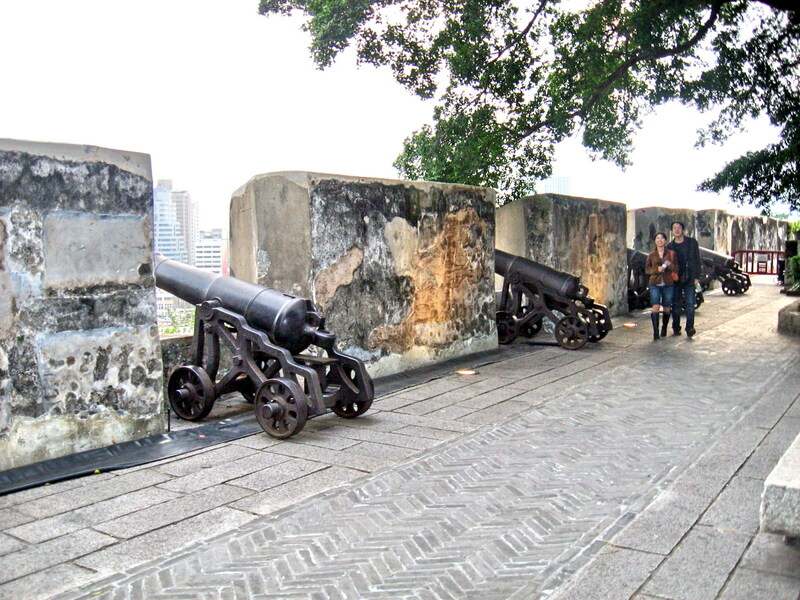 The city’s principal military defense structure, it was crucial in successfully holding off the attempted Dutch invasion of Macao in 1622. The fort was equipped with cannons, military barracks, well and an arsenal that held sufficient ammunition and supplies to endure a siege lasting up to 2 years. Its 4 corners protrude to form bulwarks. The northeastern, southeastern and southwestern walls are built on 3.7-m. wide granite bases. The walls, 9 m. high narrowing upwards to 2.7 m. wide at the top, are made of solid rammed earth, further strengthened by a thick stucco of ground oyster shells. The parapets were crenelated for the installation of 32 cannons and the two corners of the southeast wall have watchtowers. The walls facing the Chinese mainland do not have any battlements, indicating that the fortress was built only for defense against attacks from the sea. On April 18, 1998, the 2,800 sq. m. Macao Museum was installed at the site, consisting of 2 underground levels and a third one above the fortress’ top platform following the location, volume and design of the old military barracks that existed at the site before the area was demilitarized in 1965. 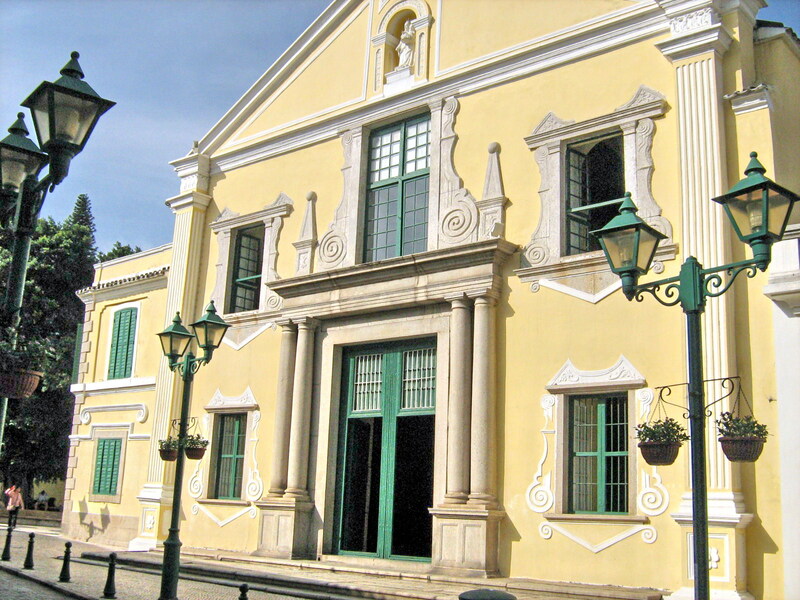 The museum presents the history of the city and territory of the former Portuguese colonyof Macau. From the Protestant Cemetery, Jandy, Cheska and I walked over to the nearby Church of St. Anthony of Padua (Igreja de Santo António) at Sto. Antonio Square. 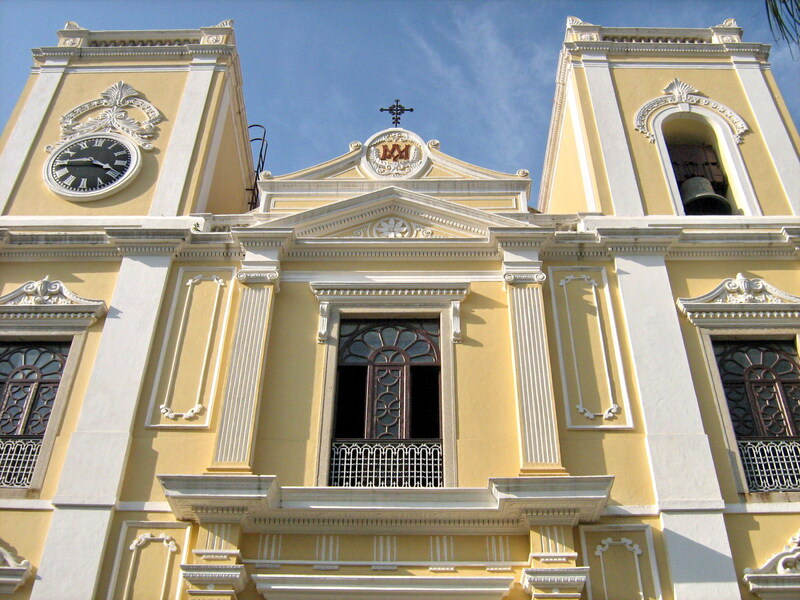 Consider to be the very first church of Macau, the original church, which marks the site where the Jesuits set up their earliest headquarters in the city, was first built of bamboo and wood before 1560. A stone church was erected in 1638, burned down in 1809 and rebuilt in 1810 and again in 1875. 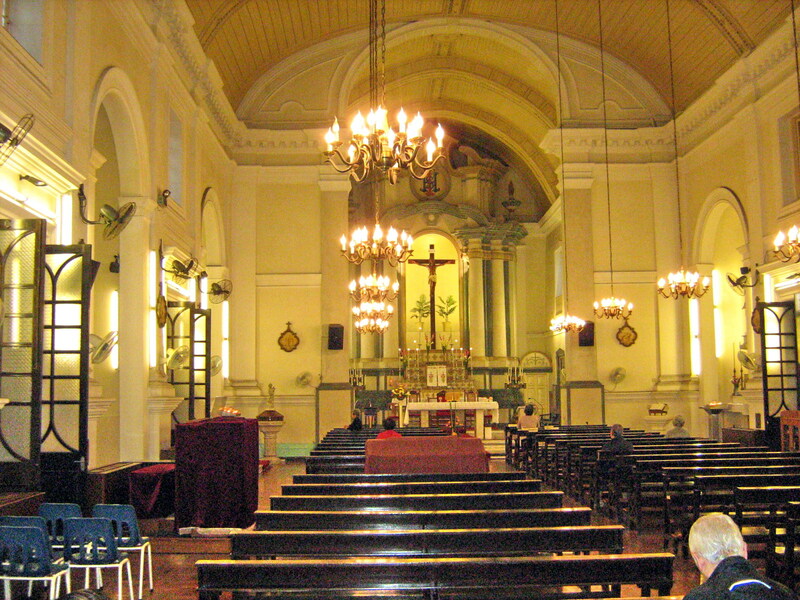 The present Neo-Classical church was a reconstruction carried out again in 1930. Further construction and repair works were done on the facade and tower in 1940. 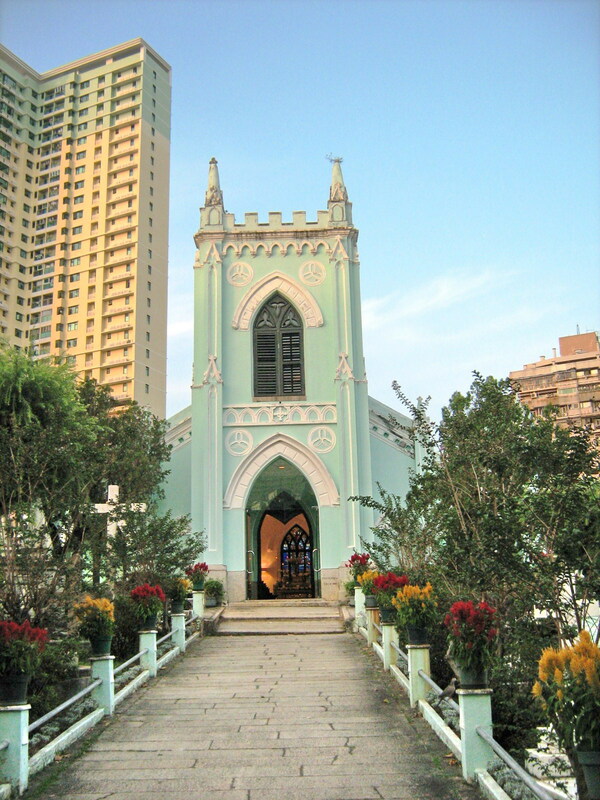 Previously, members of the Portuguese community would hold wedding ceremonies there, so giving rise to the Chinese name of Fa Vong Tong (Church of Flowers). The 2-storey church has a simple asymmetrical Neo-Classical facade, a 3-storey high bell tower and is topped by a boldly ornamented classical pediment. Decorative window architraves on the second level stretch the width of the building, providing additional architectural interest to the design. From the Camoes Garden, Jandy, Cheska and I proceeded to the Old Protestant Cemetery where 150 British and American graves recall the days of the foreign trading and naval presence in Macau. 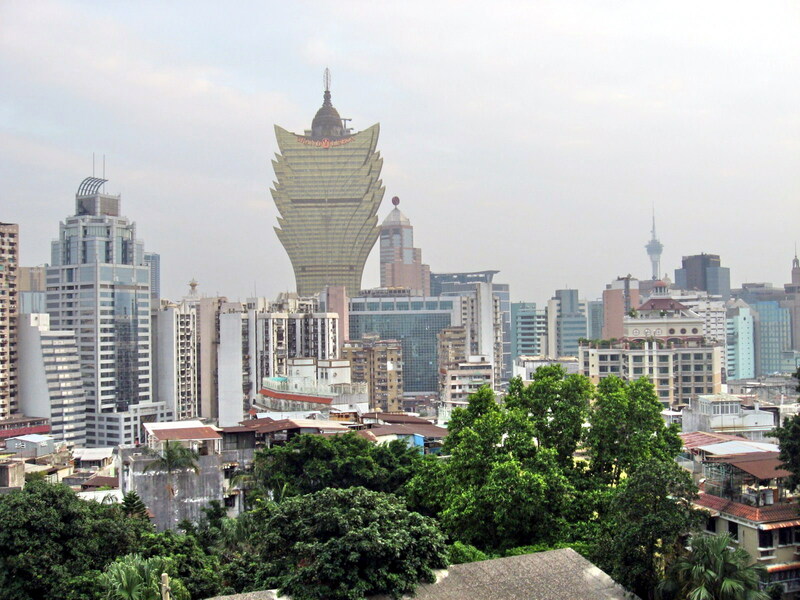 The cemetery was established by the British East India Company in 1821 in response to a lack of burial sites for Protestants in Macau. Looking around, I found it interesting reading some of the head stones and seeing just how young some people were when they died. Aside from Mr Morrison and fellow British missionary Samuel Dyer (February 20, 1804–October 24, 1843), the cemetery has a few famous residents buried there, including that of noted English painter George Chinnery (January 5, 1774-May 30, 1852) who died at his home on Rua De Ignacio Baptista. His memorial can be found on the northern wall of the cemetery. The Macau Museum has some of his works from India and the Far East. Others buried here include Royal Navy Capt. Henry John Spencer-Churchill (son of the 5th Duke of Marlborough and great-great-grand-uncle of Winston Churchill) and US Naval Lt. Joseph Harod Adams (grandson of John Adams, the second president of the United States, and nephew of the sixth, John Quincy Adams). The cemetery was closed in 1858. From the Barrier Gate, Jandy, Cheska and I took the public bus and dropped off at the hilly, heavily wooded Camoes Garden (also known as Dove’s Nest), one of Macau’s oldest parks and its largest (at nearly 20,000 sq. m.). 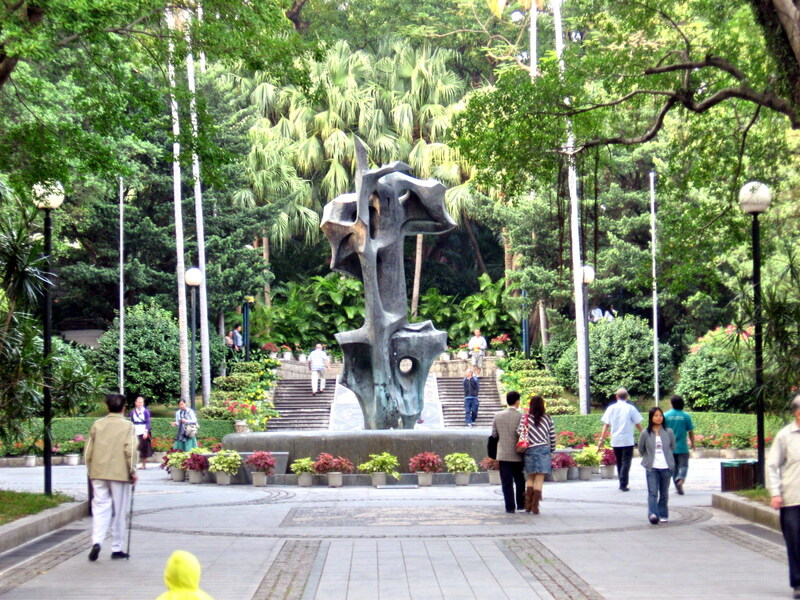 Upon entry into the park, we were welcomed by a fountain, built in 1990, that contains a bronze sculpture entitled Embrace, specially made to symbolize the centuries’ old friendship between Portugal and China. The land where the park stands was donated by a Portuguese merchant, after his death, to the government. It was later opened to public as a memorial garden dedicated to Luis Vaz de Camoes (1524-June 10, 1580), Portugal’s greatest poet, who was exiled to Macau for 2 years, after riling the court officials. 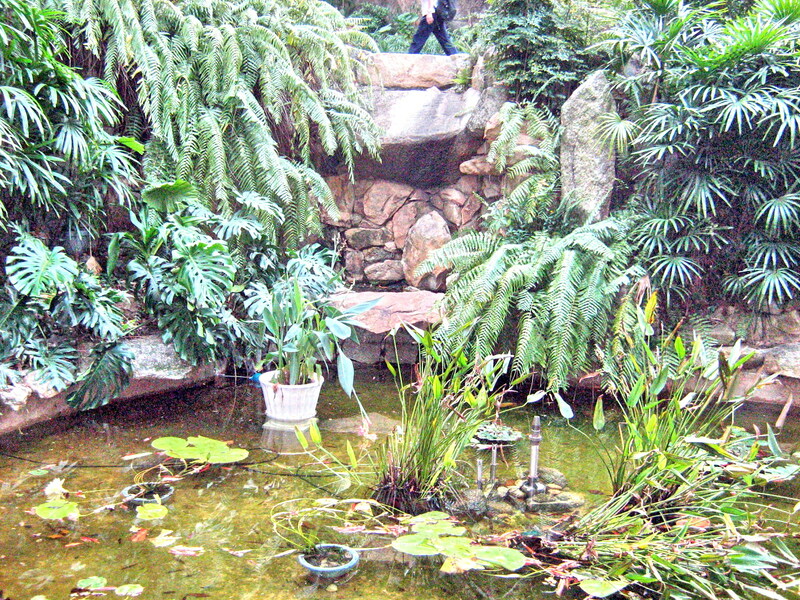 We visited the Cameos Grotto, the most famous scenic spot in this garden. Here, Luis de Camoes lived in a cave where he later finished Os Lusiadas (Soul of Portugal), the national epic that chronicles the great Portuguese explorations that created the world’s first globe-girdling empire. 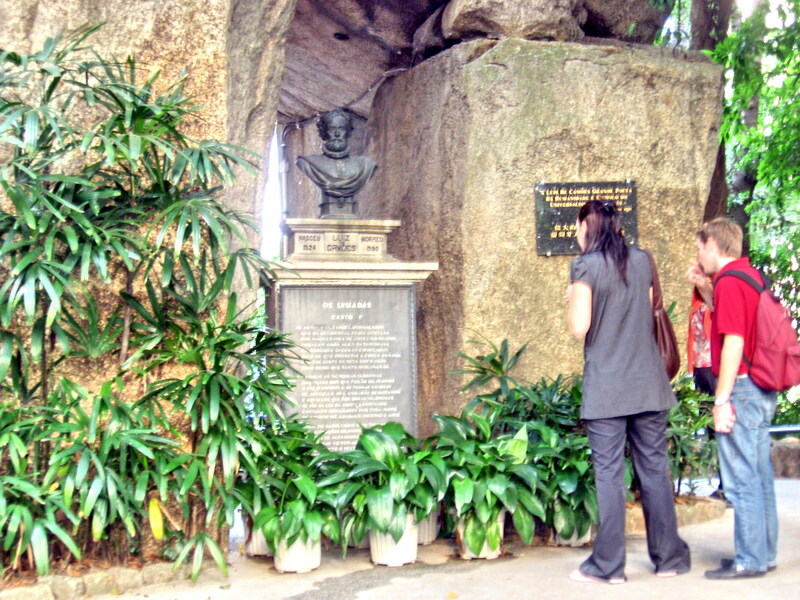 His bronze bust was installed in natural rocky alcove in the wooded garden in 1886 when the grotto became state property. 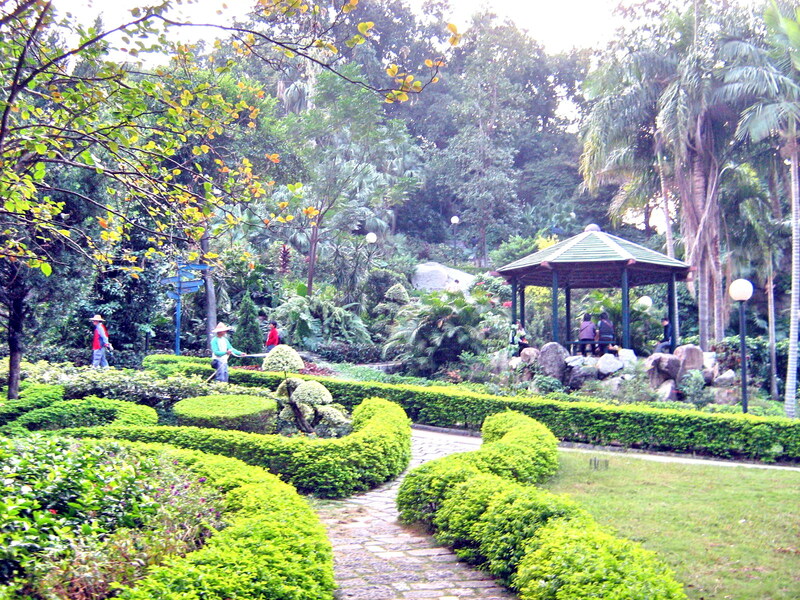 In front of the grotto is a spacious and pleasant garden, with benches shaded by banyan trees, where people meet with friends or bring their caged birds (a Chinese custom) for an outing. At the far end of the park is a statue dedicated to martyred St. Andrew Kim Taegon (August 21, 1822-September 15, 1846), the first Korean Catholic priest. Camoes Garden also comes alive in the morning when groups perform slow, silent t’ai chi or lively aerobics. Walking along the winding path, we reached the Gazebo, a Chinese pavilion at the highest point in the park. Here, stone tables and stools were installed for local people to rest, read newspapers, play Chinese checkers or chess, or enjoy the panoramic view of the city’s Inner Harbor. Luis de Camoes Gardens: Praca Luis de Camoes, Macau. Open daily, 6 AM-10 PM. 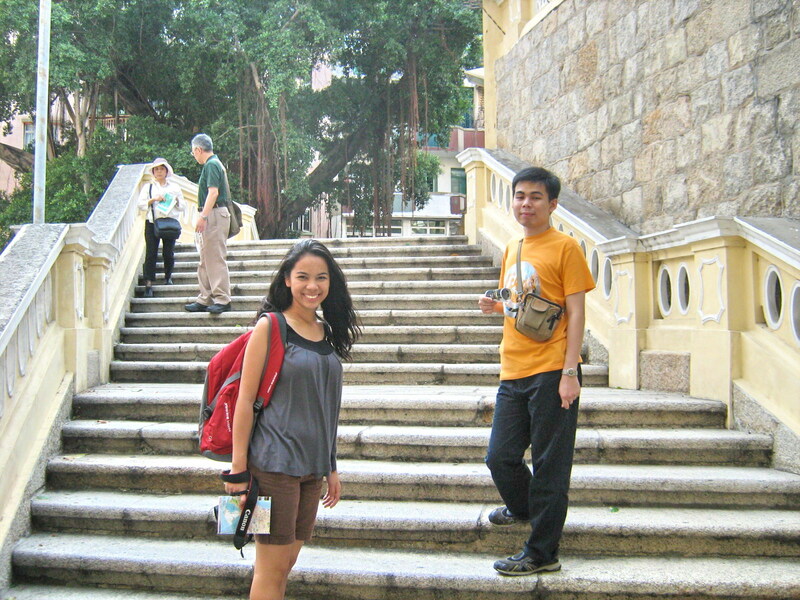 From Macau Cathedral, Jandy, Cheska and I then proceeded to St. Michael Cemetery, Macau’s largest Catholic cemetery. 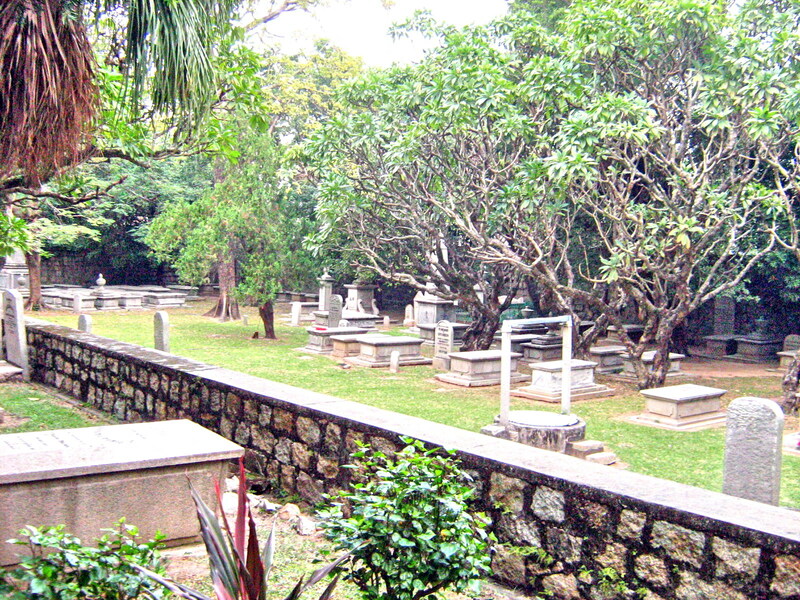 This cemetery, located northeast of Mount Fortress, along a small and quiet street between Ruins of St. Paul’s and Guia Hill, contains lavishly decorated tombstones and sepulchers that can only be described as Baroque ecclesiastical works of art, combining Chinese and European motifs, an interesting example of Macau’s cultural diversity. Near the cemetery’s main entrance is the doll-sized and charming Church of St. Michael. Dating back to 1875, tt has a tiny choir loft, pretty porticoes, pastel pea green and white walls and beautiful stain glass windows. 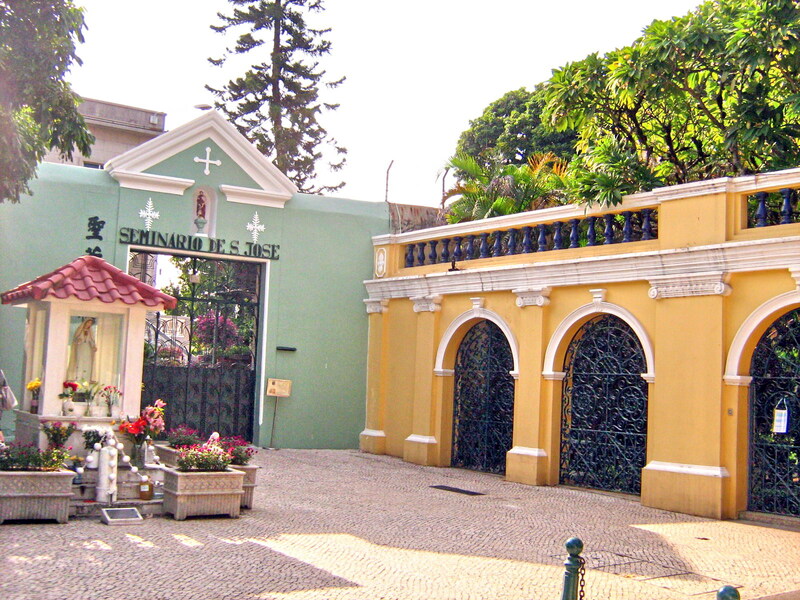 St. Michael Cemetery and Chapel: 2A Estrada do Cemitério, Northern Macau Peninsula. Open 8 AM-6 PM. 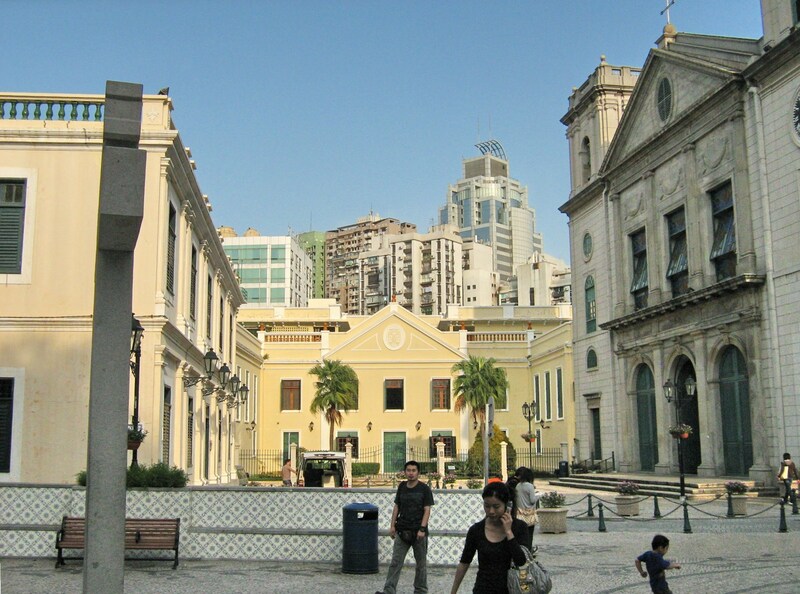 From St. Lawrence Church, Jandy Cheska and I walked over to Cathedral Square where the Macau Cathedral, Paco Episcopal Bishop’s House and Cartorio da Se and a fountain (added in the place of a car park when the courtyard was beautified from 2005-2006) are located. 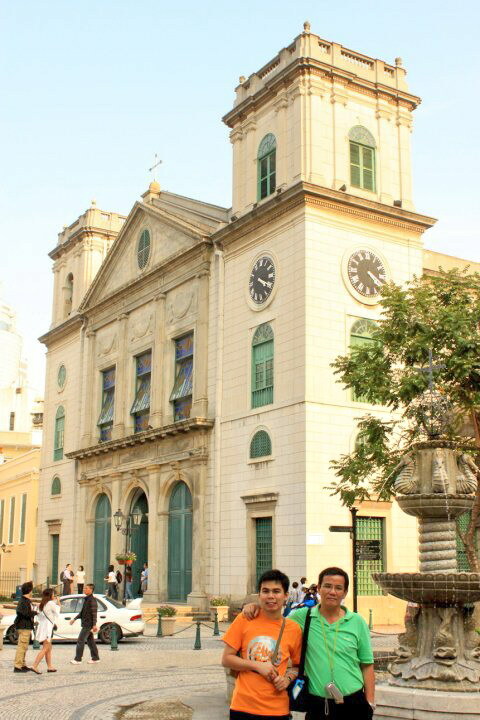 Macau Cathedral (also called Se Cathedral or, simply Se) is the mother church of the Catholic Diocese of Macau, which once included the Catholic parishes in China, Japan and Korea. It was built around 1622 and repaired in 1743 and 1780. 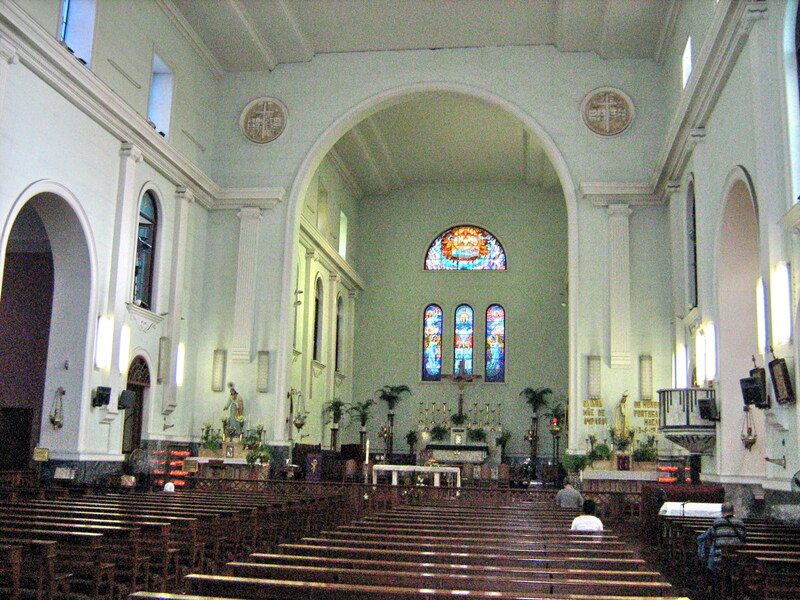 The cathedral was originally constructed with taipa (compound material consisting soil and straw). During the restoration of 1780, the religious services of the Cathedral were temporarily transferred to the old chapel of the Holy House of Mercy. 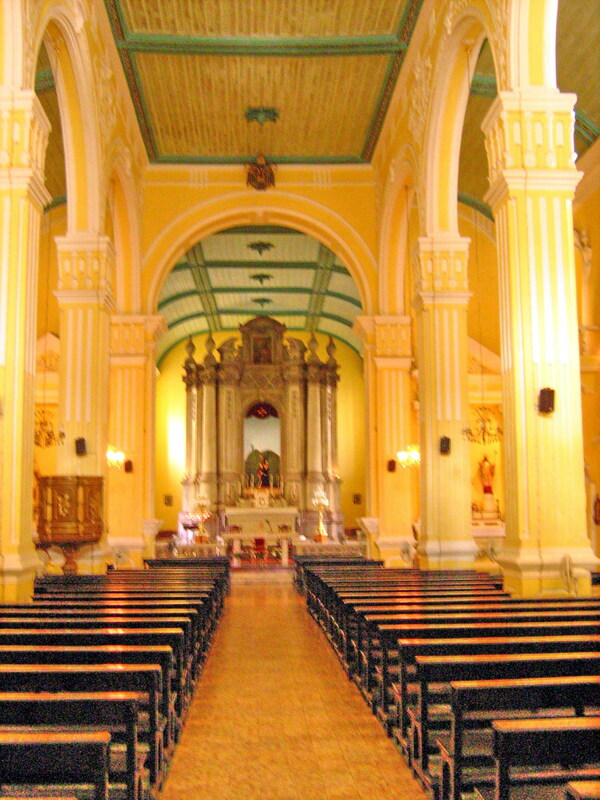 The cathedral was damaged by a typhoon in 1836 and its services were then transferred to St. Dominic’s Church, until repairs were completed in 1850, following the design of local architect Tomas d’Aquino. The facade is characterized by a massive front entrance with pilasters and the twin bell towers in front that stand out on the streetscape. The exterior is clad in Shanghai plaster, giving the church a monolithic subdued grey appearance. 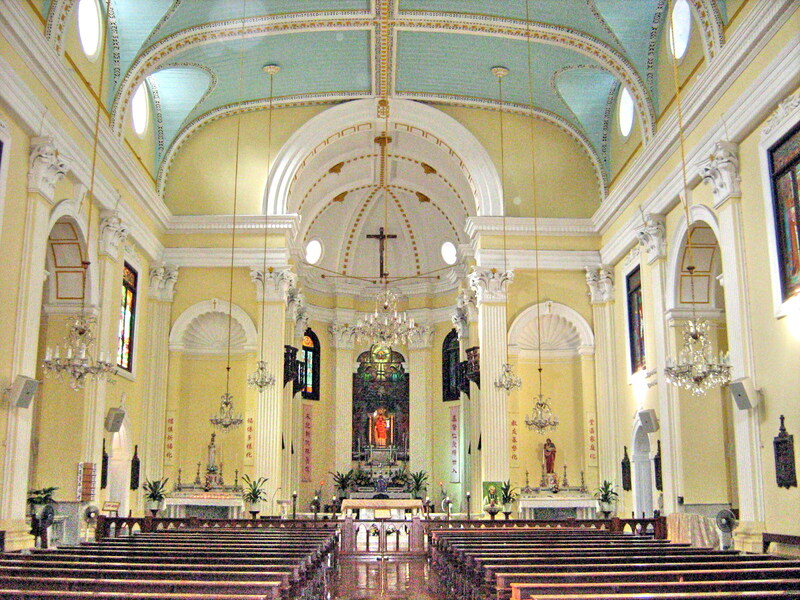 Compared to the other churches I saw in Macau, the cathedral is somewhat plain. The cathedral holds sacred relics of Japanese martyrs from the persecution of Christians in the 17th century. To the left of the cathedral (or right, if you’re looking out from it) is the Paço Episcopal Bishop’s House. Finished in stucco and painted cream, with white trimmings, it more like the other churches I saw in Macau. Right in front of the Cathedral is the Cartório da Sé (Cathedral Registrar) where marriage registrations, births and deaths are recorded. 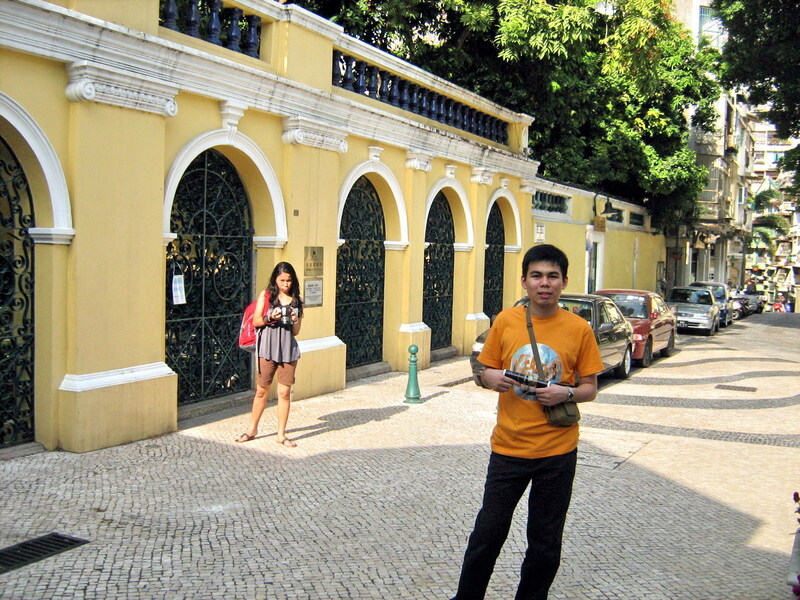 From St. Augustine Square, Jandy, Cheska and I walked next to Rua de Sao Lourenco to visit St. Lawrence’s Church (Igreja do Sao Lourenco), one of the oldest churches of Macau. It was originally built with wood by the Jesuits in 1560, with clay in 1618 and reconstructed in stone around 1803. The present church was the result of the works carried out in 1846. Located on a hilly part on the southern coastline of Macau, overlooking the sea, we approached the church via a beautiful stone staircase and entered it via an ornamental double swing, wrought iron gate decorated by a simple Greek cross symbol. Also here, on the front steps leading to the church, families of Portuguese sailors used to gather to pray and wait for the return of their loved ones, hence it was given the name Feng Shun Tang (Hall of the Soothing Winds). 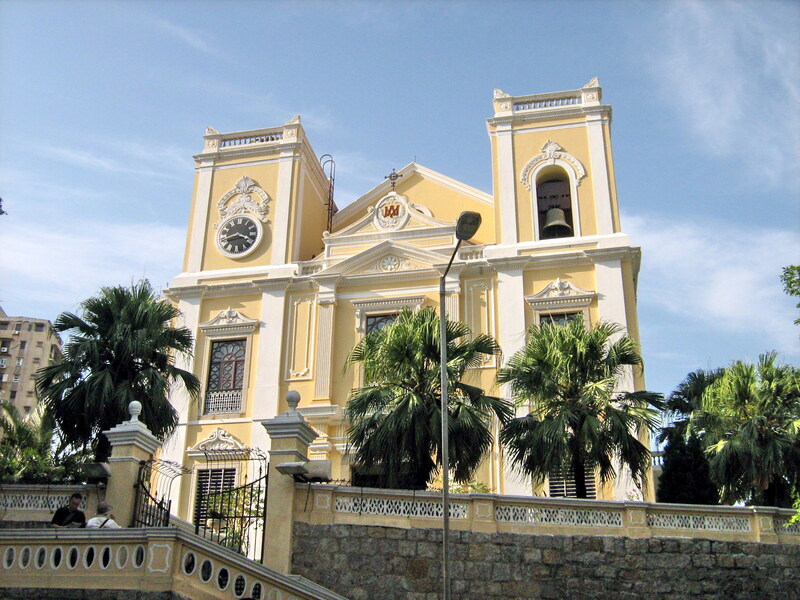 The church has a Neo-Classical facade divided into 3 sections, with the center flanked by the 2 square bell towers, each measuring around 21 m. high. The facade is filled with classical features like the pilasters and volutes over the windows and is topped by an iron cross and the symbol of Mary consisting of the intertwined letters A and M (Auspice Mari’a, a monogram of the Virgin Mary). The central section of the main facade is characterized by a pediment interrupted in the middle by an oval emblem. The ground plan of the church is in the shape of a Latin cross, measuring 37 m. by 29 m.. The shorter arms of the building form two interior chapels. The longer extension of the building corresponds to the main nave inside. 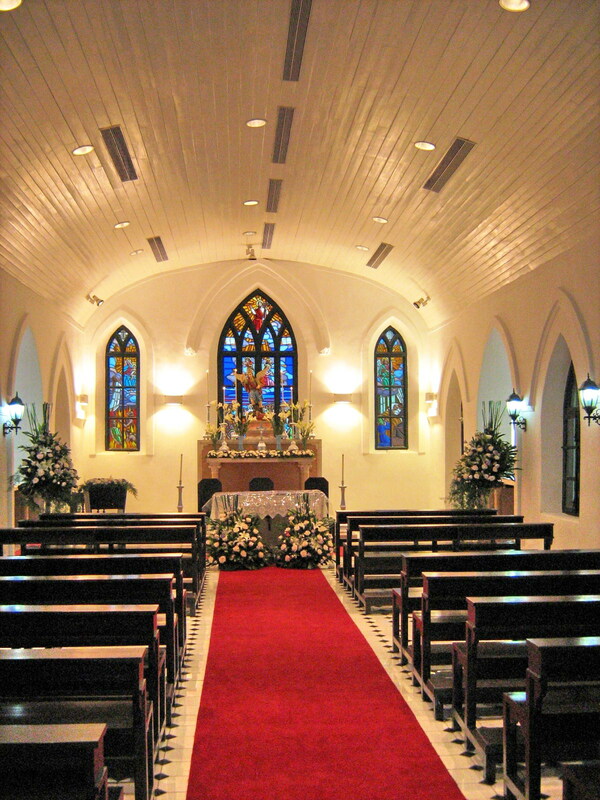 Ornamented pillars and exquisite chandeliers create an elegant church interior, heightening its ambiance. 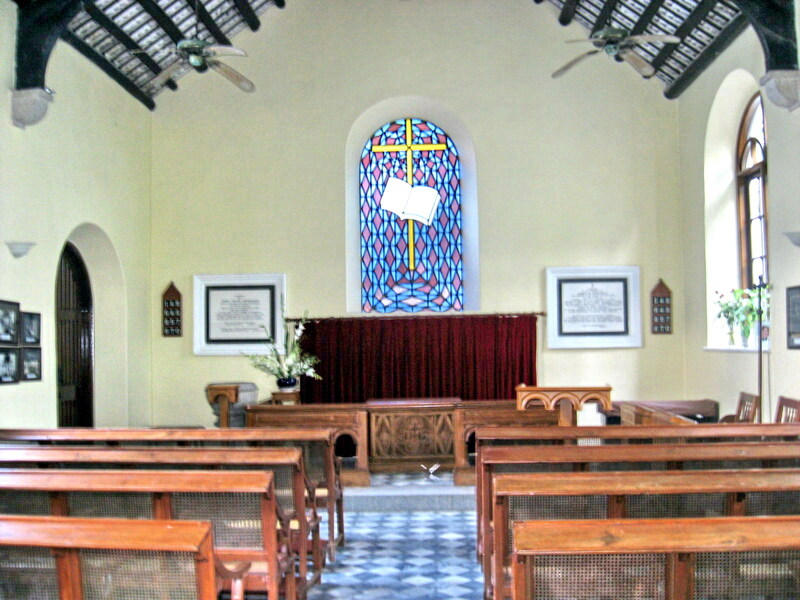 The main altar separated by a vaulted arch and the nave is covered with Chinese tiles. 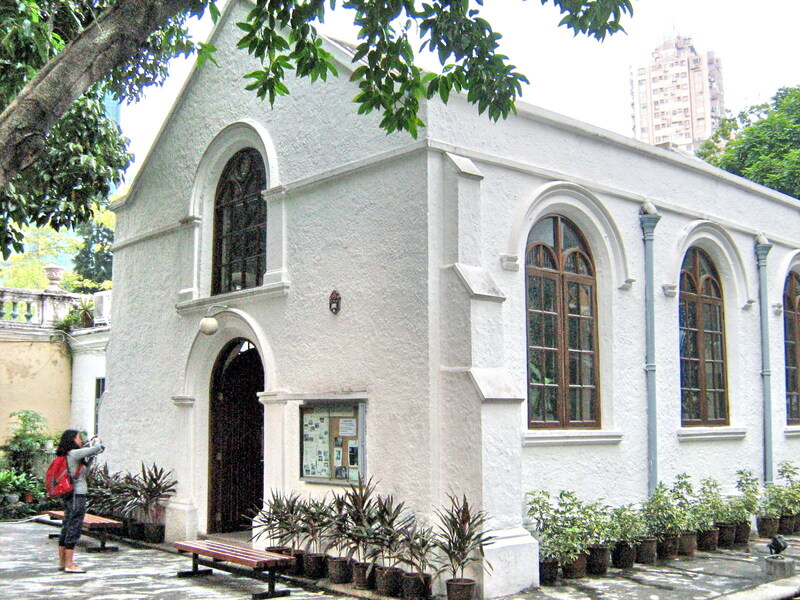 From St. Augustine Church, we proceeded to the 3-storey Sir Robert Ho Tung Library. 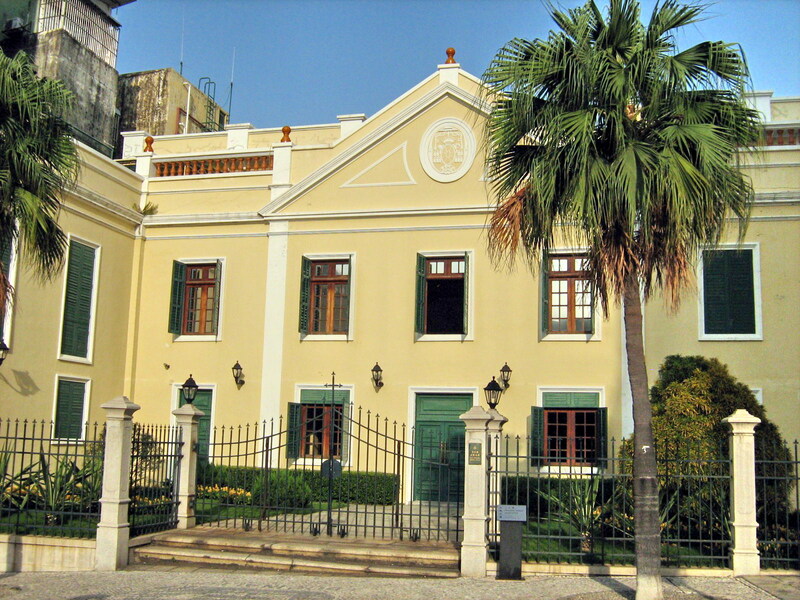 Built before 1894, it was originally the residence of Dona Carolina Cunha. Hong Kong businessman Sir Robert Ho Tung purchased it in 1918, using it as his retreat until his relocation to Macau during World War II when Hong Kong fell into the hands of the Japanese in 1941. 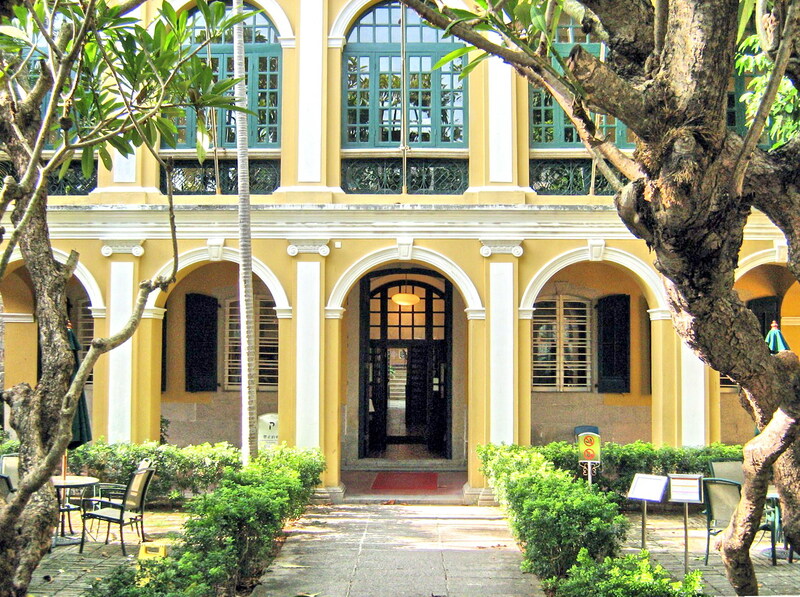 He passed away in 1955 and in accordance with his will, the building was presented to the Macao Government for conversion into a public library. 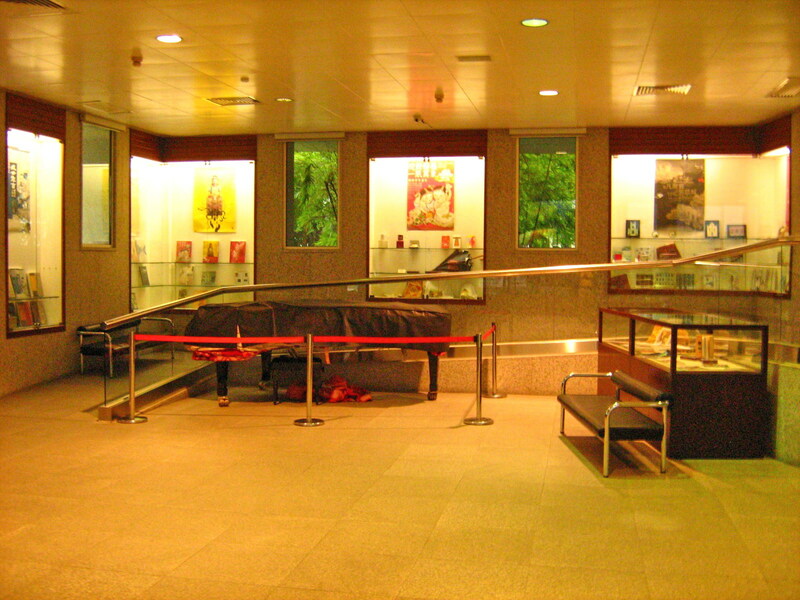 In 1958, the Sir Robert Ho Tung Library was officially opened to the general public. 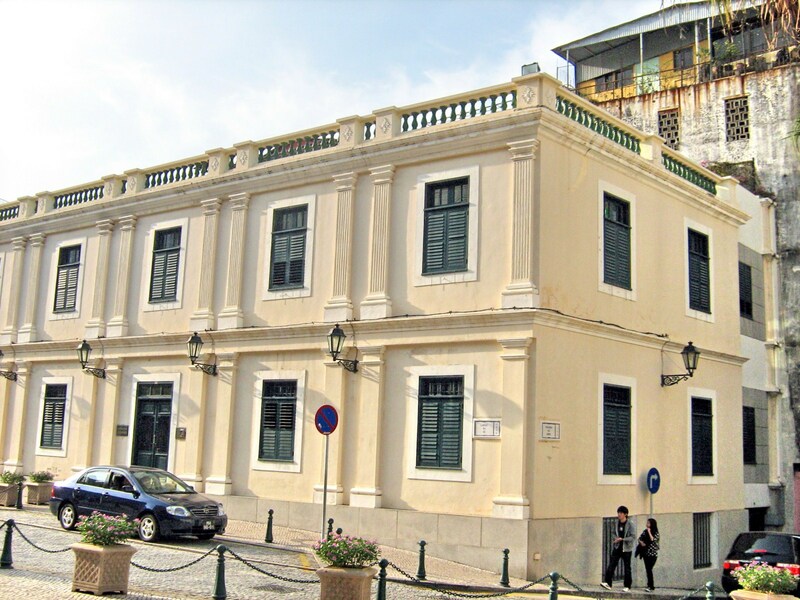 This Macanese mansion has 5 interconnecting corridors on the ground floor, while the 2 upper layers are decorated with 5 arched-windows. Its arcaded facade, decorated with pilasters and Ionic columns, is highlighted in white stucco against yellow plastered walls, with molding running along the facade’s width. The roof dome, with 4 ridges, is built in red bricks. The library’s intricate steel gate and arches open to the St Augustine Square and the St Joseph Seminary. 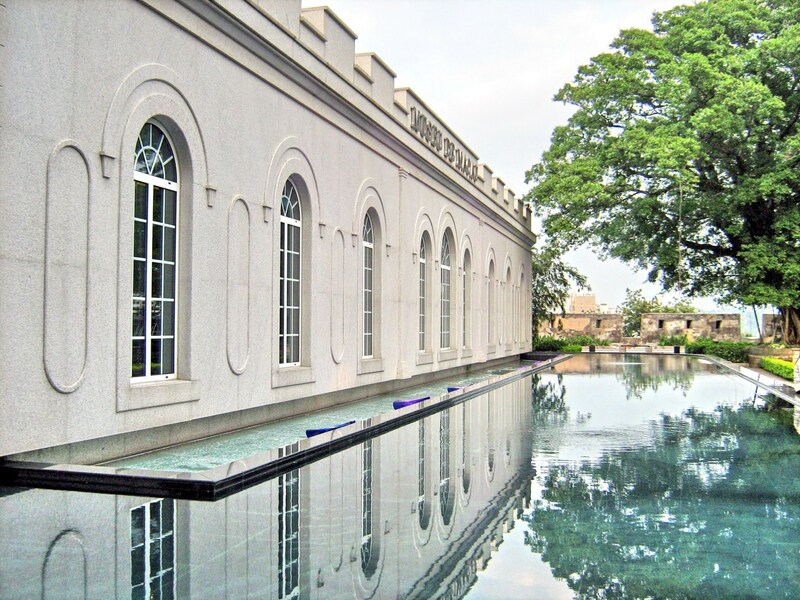 In 2005, a new MOP20 million, 4-storey building was constructed near the back garden of the mansion, making the now 30,000 sq. m. library the biggest public library in Macau. The library displays historical archives and ancient literature. At the second level, the Ho Sir Literature Archive provides 16 various categories of ancient literature and books on Chinese history and Catholicism, including the compendium of Weng Fang Gang’s Siku Tiyao (Complete Library of the Four Treasures) which constitues a large collection of books on Chinese history. From Dom Pedro V Theater, we walked further up the square to St. Augustine’s Church, part of a monastery founded in 1586 by Spanish Augustinians, was rebuilt in 1828. The facade was originally of the Baroque style but the existing facade, dating from 1814, is more Neo-Classic. 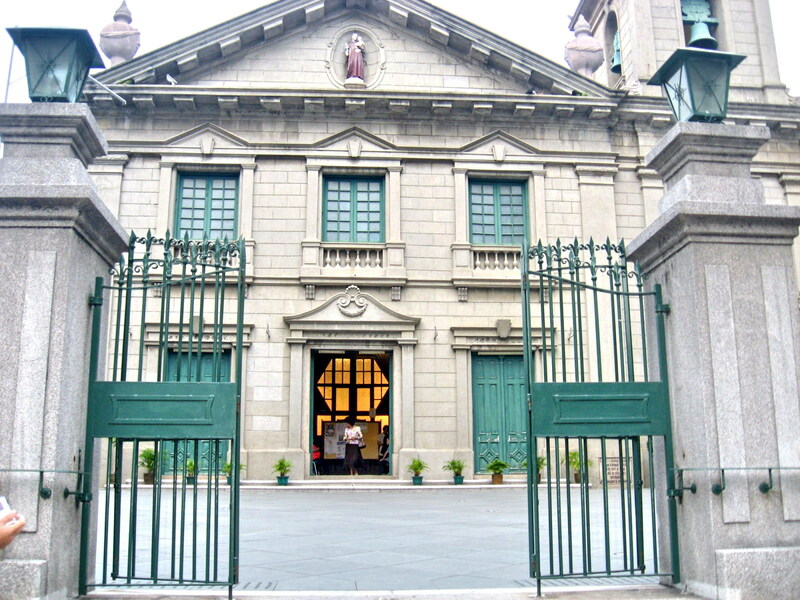 This church maintains the tradition of organizing one of the most popular processions through the city, the Easter Procession, with thousands of devotees..
Its normal (10:30 AM in Tagalog and 4:30 PM in English) Sunday religious service takes into account an especially strong participation from Macau’s large Filipino community. 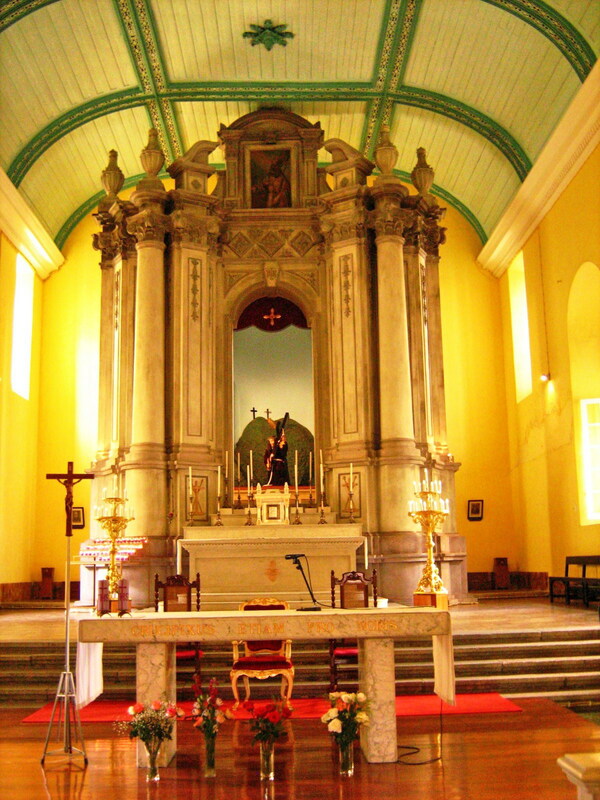 The church has a simple, Neo-Classical facade which contrasts with the elaborate decoration of the interior nave, chancel and service area. The main entrance, flanked by 2 pairs of granite Doric columns, has windows framed with simple white relief plasterwork and a triangular pediment, on the top, with a centrally located niche with statue of the Virgin Mary. The nave is divided into 3 sections by 2 rows of archways supported on Corinthian-inspired columns. The wooden ceiling over the nave is decorated with paintings, mostly over the main altar area. There are small side altars and niches following up to the main altar, with some decorative details that display a Baroque influence. Over the main entrance there is a choir that extends to the side walls, forming a narrow balcony, a design similar to that of the Church of St. Dominic’s.